If you’ve been gearing up for the approach of spring and summer (and it’s hard not to, when the stores all had their swim suits out in January this year) and have come across any of the spring/summer 2016 collection from Gucci, you will agree—the 70s are back! Gucci’s Creative Director Alessandro Michele drew inspiration from both the 1970s and the Renaissance for this collection, and we’re loving what we see. Michele acknowledges that his collection looks vintage. It’s almost as if images of models from the 1970s were superimposed to Gucci’s runway and on to Gucci’s website, but upon closer inspection there are such modern twists to the pieces that it can’t be anything but a twenty-first century design. 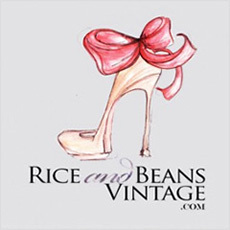 We’ll call it a nod—a generous nod—to the 1970s, and be so bold as to say Rice and Beans Vintage has presented many of the designs Michele may have drawn inspiration from to their customers, and continues to do so. Chalk it up to yet another reason to shop vintage—if you want the hottest looks of the season without the sometimes jaw-dropping price tags, look to vintage! Let’s do some exploring, shall we? This season Gucci is all about bright colors, bold patterns, all ranges of length and width, and an aesthetic more loose and flowing than other designers of today. The more I look at it, the more I love it—and the more it reminds me of vintage Gucci pieces we have seen come through the Rice and Beans Vintage door. Take for instance, this brooch-printed silk shirtdress from the spring/summer collection (who else is in love with this color?). Gucci brooch-printed silk dress. Image courtesy of Gucci.com. 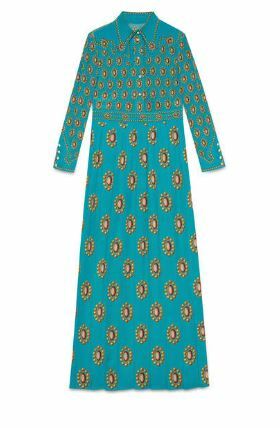 Reminiscent of this 1970s India Imports cotton maxi dress from Rice and Beans Vintage Vintage, no? 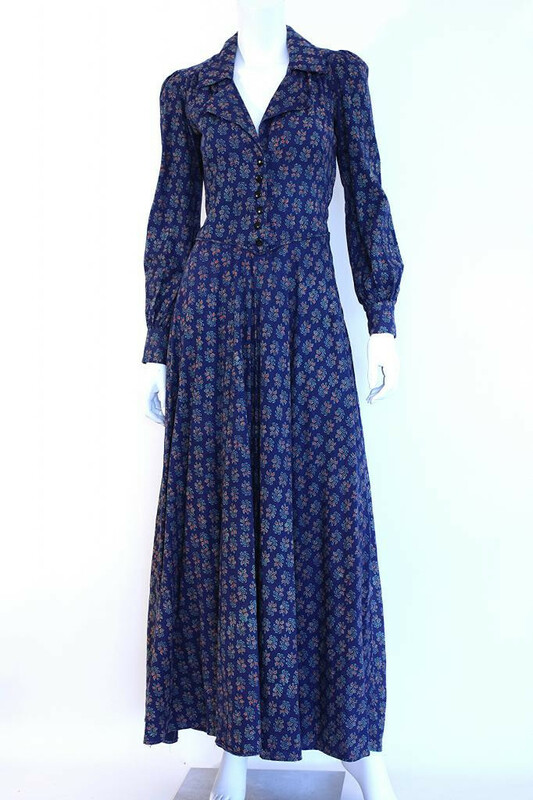 1970s India Imports cotton maxi dress from the Rice and Beans archive. 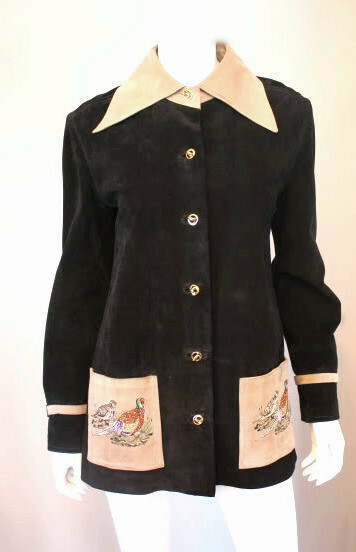 And then there’s the 1970s Gucci two-tone suede coat, also from the Rice and Beans archive. Whoever is the lucky owner of that piece will no doubt find they will be able to seamlessly blend into this season’s line from Gucci. 19740s Gucci two-tone jacket from the Rice and Beans vintage archive. 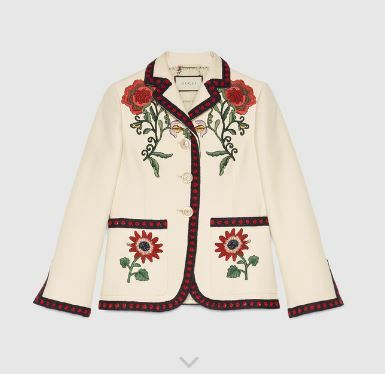 Gucci embroidered cotton jacket. Image courtesy of Gucci.com. The top handle bag has made a strong revival & each one comes with a definite vintage feel. There’s just something about those classic Gucci stripes, am I right? Or, if you’re more into a cute bag to run errands with, what about this Gucci Marmont leather shoulder bag and this 1970s Gucci blondie bag from the Rice and Beans archive? 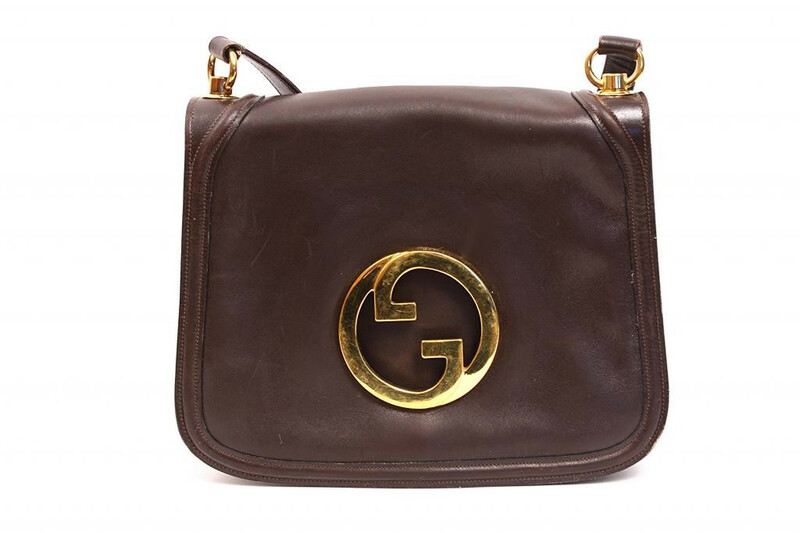 Gucci Marmont leather shoulder bag. Image courtesy of Gucci.com. 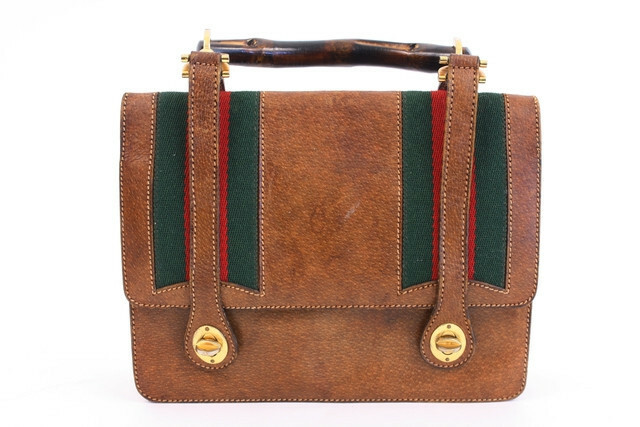 19740s Gucci blondie bag from the Rice and Beans Vintage archive. And then we get to my very favorite fashion items: shoes. Gucci has these amazing stacked platform shoes this season—we’re talking platforms up to here and heels up to there and suddenly you’re six inches taller and a little scared at the very real possibility of twisting an ankle. Not sure about you, but I’m in love with these color-blocked stacked platform leather t-strap heels. Gucci leather platform pumps. Image of Gucci.com. 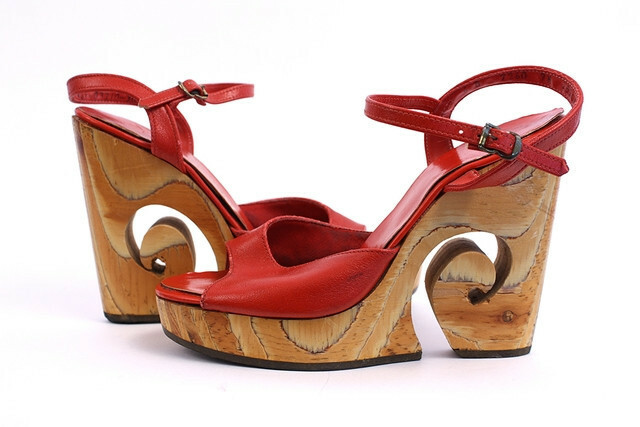 Which got me thinking about these fun Qualicraft Vintage 70’s wooden platform sandals from Rice and Beans Vintage–perfect for a summer day, don’t you think? If you’re a fan of all the loafers Gucci has sent down the runway recently, rest assured this is a look that Gucci has done—and done well—before. If you’re loving the bedazzled and decked-out loafers for sale now, check out the vintage version we have for sale! Gucci mid-heel leather loafers. Image courtesy of Gucci.com. 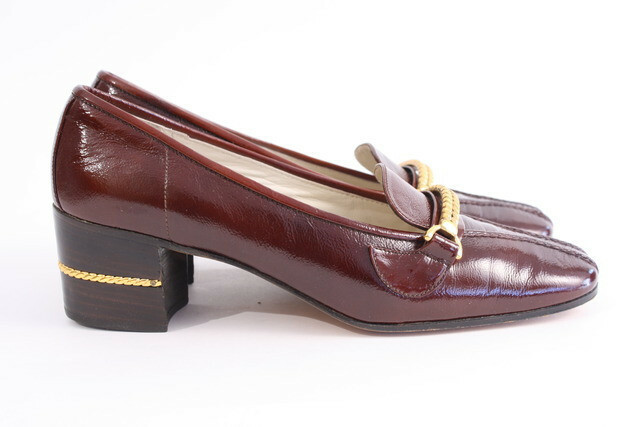 1970s Gucci heeled loafers for sale at riceandbeansvintage.com. 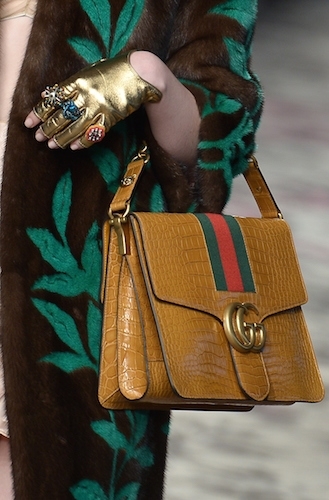 Whatever you loved (or hated) about fashion in the 1970s, Gucci is showing it’s in this season. Whether you’re reaching to the farthest corner of your closet to see if you still have those bellbottoms you loved or thinking about adding something new to your wardrobe this spring, be sure to check out Rice and Beans Vintage for all of our favorite vintage Gucci finds!